Dr. Mandy Ashley is a Bowling Green Board Certified pediatric dentist devoted to providing dental care to children, teens and also people with special healthcare needs. A standard of excellence in personalized dental care enables us to provide the quality dental services our patients deserve. We provide comprehensive treatment planning and use modern technology to provide dental care for your child. Should a dental emergency occur, we make every effort to see and care for your child as soon as possible. As a practice, we are true believers that preventive care and education are the keys to optimal dental health. We strive to provide “dental health care” vs. “disease care”. That’s why we focus on thorough exams – checking the overall health of your child's teeth and gums, performing oral tissue exams, and taking low-radiation digital x-rays when necessary. We also know that routine cleanings, flossing, sealants, and fluoride are all helpful in preventing dental disease. Not only are we focused on your child's smile, we’re also concerned about their health. A review of your child's medical history at each visit can help us stay informed of their overall health, any new medications, and any illnesses that may impact our treatment planning decisions. SKY Pediatric Dentistry uses modern technology to facilitate a quick and easy update of your child's medical history information at each visit. Infection control in our office is also very important to us. To protect our patients and ourselves, we strictly maintain sterilization and cross-contamination prevention processes using standards recommended by the American Dental Association (ADA), the Occupational Safety and Health Administration (OSHA), and the Center for Disease Control (CDC). Dr. Ashley served on the Infection Control Committee at the Samuel Simmonds Memorial Hospital in Barrow, Alaska for over 10 years and she is dedicated to preventing cross-contamination between patients. SKY Pediatric Dentistry goes the extra mile to ensure that our office exceeds standards for infection control so that you can have peace of mind regarding your child's dental experience. As your dental health professionals, we want you to be confident knowing that we are a team of highly trained and skilled clinicians. To give you the best possible service and results, we are committed to continual education and learning. We attend dental lectures, meetings, and dental conventions to stay informed of new techniques, the latest products, and the newest equipment that a modern dental office can utilize to provide state-of-the-art dental care. Also, being members of various professional dental associations helps us to stay ahead of changes and recommendations for our profession. Dr. Ashley is an experienced dentist and has won numerous awards for her work in Alaska with the Arctic Slope Native Association and during her Pediatric Dental Residency in Columbus, Ohio. In 2009, she was nationally recognized as a 'Community Health Leader' by the prestigious Robert Wood Johnson Foundation. Please check out Dr. Ashley's bio for more information. Building a foundation of trust by treating our patients as unique individuals is vital to our success. We understand how uneasy some children and people with special needs may feel about their dental visits. We can make a difference in providing a fun and positive dental experience. Our entire team is dedicated to providing your child with excellent, personalized care and service to make dental visits as comfortable and pleasant as possible. 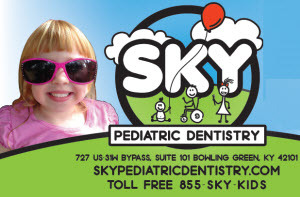 Thank you for your interest in SKY Pediatric Dentistry!